Four years ago I watched the announcement for the original MacBook Air very carefully. I had recently quit my job at Microsoft and was planning on moving back to Mac. I actually liked Windows fine (still do) but I started out as a Mac guy (I bought the original 128k Mac when I started college) and I was looking forward to coming home. I am also an an ultraportable guy, a firm believer that a portable computer is useful to the extent that you actually take it with you. And given how much I travel for work, the more portable the better. The announcement made it immediately clear that the Air was a work in progress. It had too little speed, memory, and storage for my dual power user roles as Photoshop Guy and Developer Guy Running Windows in a VM. So I swallowed my pride and I bought a basic white plastic MacBook. It had excellent performance, but I found the hardware to be cheap and unreliable, and two years later I happily upgraded to a 13" MacBook Pro. That machine performed awesomely, and looks as new today as the day I bought it. The subsequent updates to that line never even came close to tempting me. Last November I watched the announcement of the upgraded MacBook Air very carefully. So much better, especially that sweet 11" model! But still not quite there in terms of memory, storage, and performance. And I had gotten very used to my backlit keyboard. Then all the rumor channels began to line up behind an upgraded 11" Air with more memory, more storage, faster processors, and a backlit keyboard, debuting the same day as OS X Lion. That morning I boarded my plane at the Reno airport (en route to San Diego for Comic Con after a family vacation), sat down in my seat at exactly 5:30AM PST, opened up my iPad, and, as the flight attendant came down the aisle asking folks to turn off their devices, ordered a fully loaded 11" MacBook Air. I might have been the first one. I like to think so. Less than a week later, fully two days earlier than promised, it was in my grubby hands. I have been using it as my primary machine for the last three weeks, and I am finally ready to turn in my report. 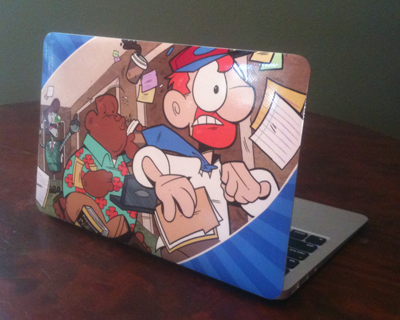 Want to buy a Not Invented Here skin for your laptop? Let us know in the comments. It's the right size for me. Before boarding my plane I spent an hour researching 13" versus 11". It turns out to be entirely a religious issue. Which is to say, it comes down to taste, and no one can convince anyone else that their way is correct. My developer side wanted more vertical screen real-estate, but I had a strong instinct that I would be more likely to take it with me if it was just that much smaller. After I ordered, and the plane took off, the gentleman in front of me lowered his economy seat all the way into my lap, and my decision was immediately vindicated. Maybe optimizing for air travel isn't the right choice for everyone, but it is where I get some of my best work done. I had been sliding inexorably into an iPad life. Increasingly as I left on a trip I was doing the math of "do I really need my laptop" and increasingly the math said "not badly enough to lug it." So I left it at home and used the iPad. If I felt I was going to do some writing, I'd throw my bluetooth keyboard into the bag. And basically I was able to get by. The problem, though, was that I was doing the math wrong. Because I use my laptop to generate a lot of income by programming, either for my comic strips or for a client. And my road trips are often full of long stretches of downtime perfect for programming. So I was sacrificing a lot of money for a little convenience. Now that trend has been reversed. I still enjoy traveling with my iPad, but now my Air is in my man-purse as well. And both of them, combined, weigh less than my old laptop. Is it silly to travel with both? I find that they complement each other well. Last week while getting some work done in a hotel I often found myself working on the Air while the iPad was next to it in its upright position, functioning as a sort of second monitor, running Netflix or Twitter or FaceTime. You can find great reviews of the Air and Lion elsewhere, so here are some notes that function as errata on more comprehensive reviews. Full-screen mode feels not fully baked. For example, clicking on a URL in Mail shows Safari's tabs in the background, but not Safari. And I personally find myself getting fairly confused at the relationship between full-screen apps and the everything-else desktop, so I can only imagine that less sophisticated users would struggle even more. It's obviously the right thing for power users on laptops - I am already heavily annoyed at all the apps that don't support it - but I suspect we'll see some fine tuning as everyone plays with it more. On that note, full-screen Terminal is my favorite single feature of Lion. The Air's much-vaunted suspend mode has been flakey for me. First it very clearly wasn't even suspending, so I turned off various Bluetooth options. Then it suspended unreliably, thrice requiring me to fully power down. I followed a suspicion and started independently suspending VMWare before shutting the lid, and it's worked perfectly since. After returning from stand-by, WiFi usually doesn't reconnect correctly. I like the new gestures a lot. My wife, who is very skeptical about upgrading her OS (and who just inherited my old 13" MacBook Pro via the family technological trickle-down effect), openly gosh-wowed at the three-finger switch-to-next-full-screen. And I just discovered the three-finger swipe-to-mission-control, which has made that feature a lot more accessible. Hardware feature that pleases me far more than it really should: the "eject" key on the keyboard is now a power key, now that there's nothing to eject. In moving to the Air as my primary machine I lost 4GB of RAM, which I haven't really noticed, perhaps because the solid state drives are so quick that swapping is a lot faster, and 64GB of storage. The latter has been a struggle. I am always close to the edge. I don't quite understand, yet, how to manage my files appropriately, especially my media. I'm used to having my laptop be my hub, with everything on it. And now I don't think that's quite possible or appropriate, but iTunes doesn't seem equipped for such things, at least not in an obvious way. For non-media my current theory is to tell DropBox not to store everything on this laptop. Just leave lesser used files (e.g. high-res originals of nine year-old comic strips) in the cloud, and I can sync up to them on an as-needed basis. The bottom line is that I haven't missed my MacBook Pro at all. And there are lots of times, lots, that I have picked the Air up and taken it with me, where I never would have before. Just now I decided to move into the living room for a change of pace. That's something I do with my iPad all the time, for reading mail and such, but almost never when I'm in the midst of writing. This may sound petty if you've never lived through it, but I have been healing from a rotator cuff injury for the last eighteen months, and it simply hurts less to move this thing around in little ways like moving to the kitchen counter and readjusting it in my lap. Your mileage may vary. But mileage gets better when weight decreases, so I feel very comfortable recommending this, the finest computer I have ever owned.